At the center of this silver-toned, double-spiral crystal hanger is a gorgeous molded Guardian Angel. 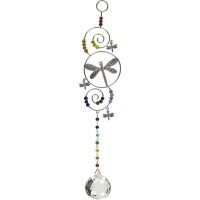 This crystal hanger features an enchanting molded silver-toned Guardian Angel holding a teardrop crystal. Woven throughout her swooshing spirals are blue and ruby beads. At the base of the largest spiral is a strand of alternating matching beads and a stunning multi-faceted clear crystal sphere. The attached loop makes hanging easy. 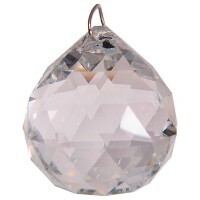 Crystal hangers add sparkle and shine to any home, patio or garden. Hang this gorgeous beaded wire and crystal prism indoors or out (recommended in a shaded, protected spot if hung outdoors). It is hand made in India and measures 12.5 inches long with attached loop for hanging. Item Number: KK-62915 | Approximate Size (Inches): 4.00 wide x 0.10 deep x 12.50 high | Approximate Shipping Weight: 0.50 lbs.